The BCG vaccination is used to help prevent people getting tuberculosis (TB). TB is not common in New Zealand, so BCG vaccinations are not routinely given. The Ministry of Health recommends that children under 5 who have a higher risk of catching TB should get the BCG vaccine. The BCG vaccine is free for those children. will be living for three months or longer in a country with high rates of TB, before they are 5 years old. some Pacific nations (except the Cook Islands, Niue, Samoa, Tokelau and Tonga). The best time for the vaccination is within a few days of birth. 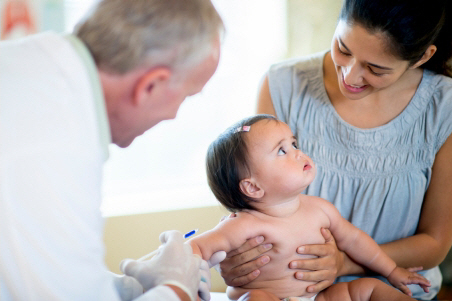 Your child can be vaccinated any time if they are under 5. But if they are older than 6 months, they need to be tested before being vaccinated. The test is called the Mantoux test. It tests if your child has been exposed to TB. Your midwife or GP should tell you if your child should be vaccinated. Talk to one of them if you think your child has a higher risk of catching TB. Information about TB and the BCG vaccine including how to care for your child after they have had the vaccination. This information is also available in Māori, Amharic, Arabic, Burmese, Cambodian-Khmer, Chinese Simplified, Chinese Traditional, Fijian, Hindi, Japanese, Kiribati (Gilbertese), Korean, Persian (Farsi), Pushto Afghani, Somali, Tuvaluan and Vietnamese. Written by HealthInfo clinical advisers. Last reviewed January 2017. Last updated November 2018.